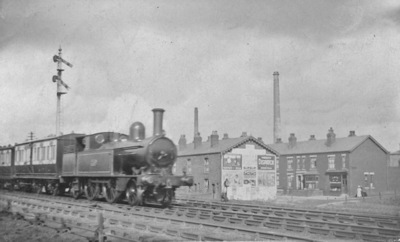 The picture shows an unidentified 2-4-2T on a local service. Neither engine number nor any street names are legible. Any ideas anyone? The signal is LYR, and I guess the location is on the line from Miles Platting to Stalybridge - possibly Clayton Bridge. The Dispatch was a Manchester newspaper. The first coach is a 32ft 0in lavatory composite brake D.230. Definitely on the L&Y and Lancashire style terraced houses! I may be way out with this but the location, if not the stock, suggest the Liverpool, St Helens & South Lancashire Railway from the original St.Helens Central station crossing above (possibly) Standish Street or Tolver Street with Pilkington Brothers plate glass chimneys behind. I don't think this is St. Helens round Tolver Street and certainly not round the old Great Central station. The houses didn't have bay windows like the one in the picture. They were terraced but opening straight to the street. Central Street ran parallel with the line. This is on the Lancashire Union line (joint L&Y & L&NWR) between Chorley and Cherry Tree Junction, just to the north of Chorley No.5 signal box (looking north east across the line). The thoroughfare in the background is Brock Road - the shop is now a chippy! Many thanks Chris - this one has worried me (on & off) for six years!